It’s never too early to begin teaching children about the way America’s voting system works, and this is the premise of author Bonnie Worth’s new rhyming picture book, One Vote, Two Votes, I Vote, You Vote. 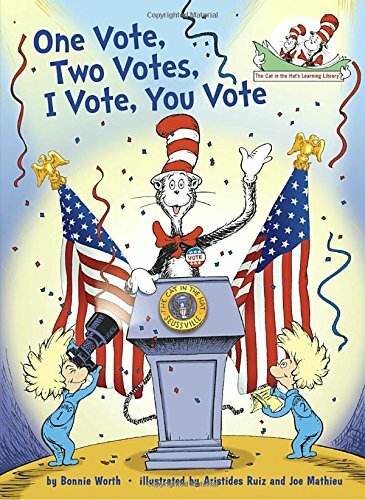 Using Dr. Seuss’ beloved Cat in the Hat as the book’s narrator/mascot, One Vote, Two Votes hits the ground running, informing young children about what voting is, what kinds of things people vote for, and what may happen when people do or don’t vote. It explains that the most important vote of all is for president or vice president of the United States, then goes on to explain how often the people who hold these positions are voted in or out, and what it means to live in a democracy. The prose plods forward in this manner, explaining everything from the campaign trail and watching candidates on the news to speeches, ads, and shaking hands to win votes. Any- and everything that has to do with voting or even thinking about voting seems to be included in the text, which, unfortunately, has rhymes and meter that are often off-beat and hardly conjures memories of a Dr. Seuss text. There is a somewhat surprising ending: after all the details about voting in a democracy are discussed, The Cat in the Hat suddenly reveals that he is running for some type of office and wants readers to vote for him. Unfortunately, it is not clear what office he’s running for or why he (or the author) waited so long to even reveal that this was the book’s premise. Although it is apparent that One Vote, Two Votes is a book with a noble mission, it unfortunately ends up being a wordy 48-page crash course in voting rights and responsibilities that may overwhelm young children and disappoint diehard Dr. Seuss fans who are looking for that Seuss-ian precision of rhyme, meter, and beat that everyone adores. However, if young readers and the parents or teachers who assist them can forgive the fact that this is not a Dr. Seuss book (despite having the Cat in the Hat on the cover), the book can prove useful for independent reading during election years, or as a discussion-starter in early social studies classes. There is a glossary of important words like absentee, moderator, and responsibility, and an index to help students find important concepts like Green Party, Libertarian Party, and Constitution.